By 1917 the war had been raging for three years, and the toll on all belligerents was severe. Indeed many nations were close to collapse; resources were being expanded at a never before seen rate—including manpower. Soldiers at the front had quickly outgrown any initial optimism through the conditions at the front and the negligible movement of the front line. However, all countries had lost too much to accept anything but victory. So the fighting would continue until countries would bleed out. 3rd - General Sir Douglas Haig is promoted to the rank of Field Marshal. Douglas Haig is in command of the British army. Opinions on Haig will range from a butcher all the way up to the man who won the war. These opinions are still debated to this day. An important thing to remember is that all generals had to struggle with adapting to modern tactics based on the new technologies. 19th - Germany sends a secret message to its ambassador in Mexico proposing a military alliance with Mexico and possibly Japan if the USA seemed certain to enter the war. The message, known as the Zimmerman telegram, was intercepted by British intelligence and would successfully be decoded. 31st - Germany announces it will begin unrestricted submarine warfare. 3rd - USA severs diplomatic ties with Germany in response to the revival of unrestricted submarine warfare. 23rd - Kut taken back by British forces but the Turkish army manages to retreat, avoiding another siege. German forces on the western front begin withdrawing to a series of heavily fortified defensive positions, known as the Hindenburg line. 25th - British passenger ship RMS Laconia is sunk by a German U-boat, 12 people are killed including two American passengers. 28th - The Zimmerman telegram is released to the American press. This along with the submarine warfare is stoking anti-German sentiment within the USA. 11th - Baghdad occupied by British forces. 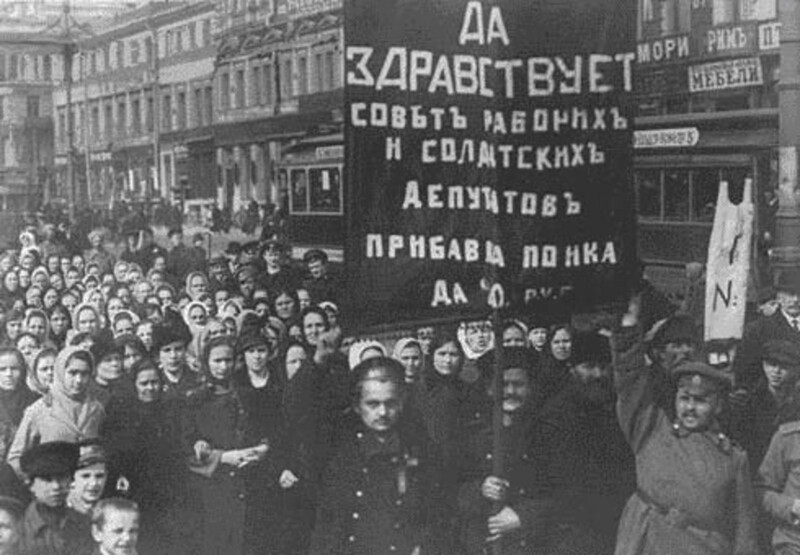 A series of strikes lead to a revolution in Petrograd, the capital of Russia. Troops are brought in to control the situation. 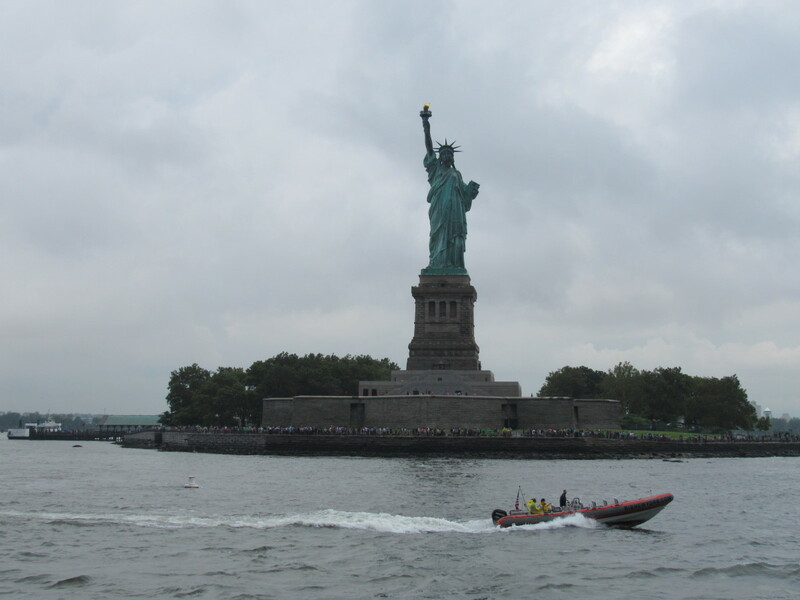 However, most are reluctant to use force due to the large amount of women protesting, and they begin to mutiny. 15th - The Tsar of Russia, Nicholas II, abdicates. He is then placed under house arrest alongside his family. A provisional government takes control of Russia. The Petrograd Soviet is established to represent workers and soldiers. 26th March - The first battle of Gaza begins. British forces try to capture Gaza, but Turkish forces successfully defend the town. 5th - German withdrawal to the Hindenburg line is completed. 6th - The USA declares war on Germany. This marks the first major intervention of the United States on to the world stage. 7th - Cuba and Panama declare war on Germany. 9th - The battle of Arras begins. British forces attack German defenses across a broad front around the French city of Arras. 16th - Vladimir Lenin returns to Russia by train. Lenin is a socialist revolutionary in exile and his return is facilitated by Germany to destabilise Russia. 16th - The second battle of the Aisne begins. French forces attack the Germans along the Aisne front. 17th - Second battle of Gaza begins. British troops will try again to capture Gaza. 19th - Second battle of Gaza ends with Turkish forces retaining the city. 9th - Second battle of the Aisne is abandoned. The line was advanced but at a large cost to the French army. The offensive failed to deliver a decisive breakthrough. Significant numbers of French troops began to mutiny. The troops would remain in the line but refused to carry out attacks that they thought were futile. 10th - Major General John J. Pershing is appointed to command the US expeditionary force. 15th - General Nivelle is sacked due to the French mutiny and replaced by General Pétain. He restored French morale by: changing strategy from attack to defense, resting exhausted units and disciplining a small number of mutineers. 17th - The battle of Arras ends. The early days of the offensive achieved impressive gains, notably Vimy ridge. However, no breakthrough was achieved and it ended in a stalemate with yet another high casualty count. 7th - The battle of Messines begins. This is the first of a series of battles fought by the British to try and breakthrough at Ypres and relieve pressure on the French. 9th - The Russian provisional government refuse a German proposal for an armistice. 14th - Battle of Messines ends. The battle was only a prelude to further battles but it was a British success and inflicted heavy casualties on the German forces. 25th - First US troops arrive in France. 26th - Greece joins the war on the side of the allies. 1st - The July offensive begins on the eastern front. Russian forces attacked the Austro-Hungarian and German forces in Galicia. 19th - German and Austro-Hungarian forces counter attack on the eastern front. The Russians had initially been successful against Austro Hungarian troops but the attack stalled due to Russian losses and soldiers refusing to follow orders. 22nd - Siam, now known as Thailand, declares war on Germany and Austria-Hungary. 28th - The battle in Galicia ends. The counterattack was met with little resistance and hence pushed deep into Russian territory, through Galicia and into Ukraine. However, Romanian forces had been successful with their offensive and managed to deal a blow to the central powers on the eastern front. 28th - Tank corps formed in British army. 31st - Third battle of Ypres begins. British and French forces attack German defenses with the aim of capturing ridges to the south and east of Ypres. 4th - Liberia declares war on Germany. 14th - China declares war on Germany and Austria-Hungary. Chinese labourers will perform support roles and manual labour instead of combat roles on the western front. 20th - French forces attack the Germans at Verdun. 26th - The French forces capture their objectives at Verdun. 3rd - German forces capture Riga on the eastern front. 12th - Battle of Passchendaele begins, this is the final phase of the third battle of Ypres. 26th - Brazil declares war on Germany. 6th - Passchendaele is captured by Canadian forces. 7th - Lenin leads a Bolshevik coup to take over the Russian government. This leads to the first ever communist run country with Lenin as Premier. Forces opposing this ideology, known as the white army, almost immediately begin a civil war with Lenin's red army. This would last until 1922 with the soviets eventually emerging victorious. 10th - Third battle of Ypres ends. The battle was marred by unusually wet weather and treacherous mud. The battle had achieved gains for the British but with large casualty counts on both sides. 20th - Battle of Cambrai begins, this is the first mass use of tanks (over 450) by Britain to attack the German Cambrai salient. The attack was a surprise and made impressive gains on the first day. 30th - German forces begin a counter attack at Cambrai. 3rd - Battle of Cambrai ends, the German counter attack has taken back almost all of the initial British gains. 7th - The United States declares war on Austria-Hungary. 9th - British troops capture Jerusalem. 9th - Romania signs an armistice with the central powers. After the Russian revolution Romania was left isolated and surround by the central powers. 10th - Panama declares war on Austria-Hungary. 15th - The Russian Bolshevik government signs an armistice with the central powers, ending the conflict on the Eastern front. Peace negotiations will now follow. Germany can now move some of its troops from the eastern front to reinforce the western front. 16th - Cuba declares war on Austria-Hungary. With the exit of Russia from the war, the major focus of 1918 was on the western front. By now harsh lessons had been learnt, the new tactics were fully developed, and mobile warfare returned to the western front for the first time since the start of the war. Both sides would launch major offensives in an effort to try and finally gain a victory. Eventually, Germany would collapse under the large allied pressure and peace would return to Europe and the world. 8th - President Wilson gives a speech to the US Congress outlining his fourteen points. These points will be used as the basis for negotiating a peace. 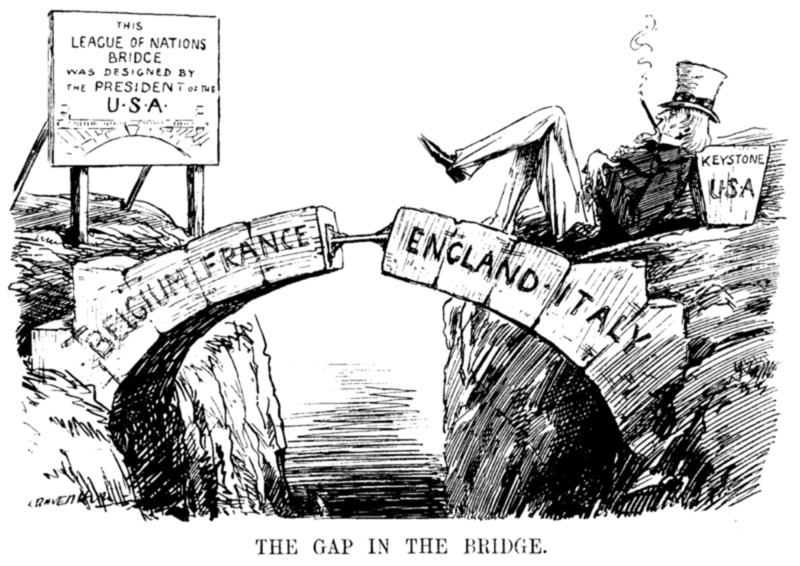 10th - Russia announces that the state of war with the central powers is ended but they won't sign a peace treaty. 18th - Frustrated by the Russian stalling in negotiations, Germany resumes attacking Russia. 19th - Russia notifies Germany of a willingness to sign a peace treaty. 28th - Hostilities cease and negotiations between Russia and the central powers resumes. 3rd - Russia sign the peace treaty of Brest-Litovsk with central powers. 5th - Preliminary peace treaty signed between Romania and the central powers. Germany begins a series of large, surprise offensives to try and breakthrough the allied lines and end the war before the US troops are ready to have a significant impact. 21st - The German spring offensive begins with the kaiserschlacht also known as operation Michael. The German troops attack the British lines near St Quentin to try and separate the British and French armies. The offensive consist of a series of battles: the battle of St. Quentin, the first battle of Bapaume, the first battle of Noyon, the battle of Rosières, the first battle of Arras, the battle of Avre and the battle of the Ancre. 26th - Ferdinand Foch is appointed supreme commander of allied forces. This marks the increased coordination between the British and French armies as the war had progressed. 1st - The British government creates the RAF (royal air force), a new branch of the armed forces. It is formed by combining the RFC (royal flying corps) and the RNAS (royal naval air service) which were previously under control of the army and navy respectively. 5th - Operation Michael ends. The German army made an impressive breakthrough but it quickly ground to a halt. The Germans were using their best soldiers as stormtroopers and taking heavy casualties. These troops couldn't been replaced but the allied casualties could be replaced by the incoming US troops. The ground captured was also in such bad condition that defense and the construction of reinforcing supply lines was extremely difficult. The failure of the kaiserschlacht to break the allies marked the end of any realistic chance of Germany winning the war. 9th - German Lys offensive begins, also known as operation Georgette. This consists of multiple battles: the battle of Éstaires, the battle of Messines, the battle of Hazebrouck, the battle of Bailleul, the first battle of Kemmel ridge, the battle of Béthune, the second battle of Kemmel ridge and the battle of the Scherpenberg. 12th - Field-Marshal Haig issues his famous "Backs to the Wall" order. 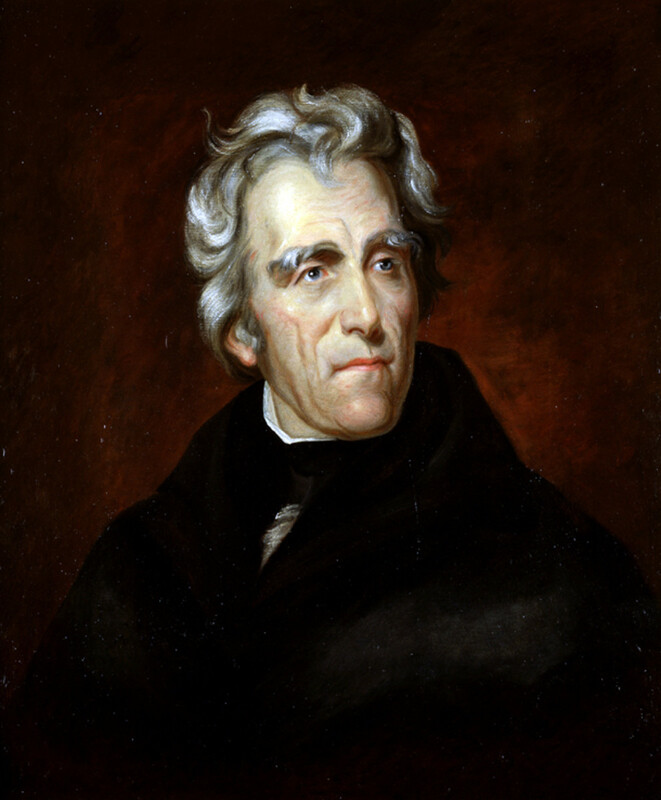 In it he urged the British troops to fight it out to the end. Many amongst us now are tired. To those I would say that victory will belong to the side which holds out the longest. The French Army is moving rapidly and in great force to our support. There is no other course open to us but to fight it out. Every position must be held to the last man: there must be no retirement. With our backs to the wall and believing in the justice of our cause each one of us must fight on to the end. 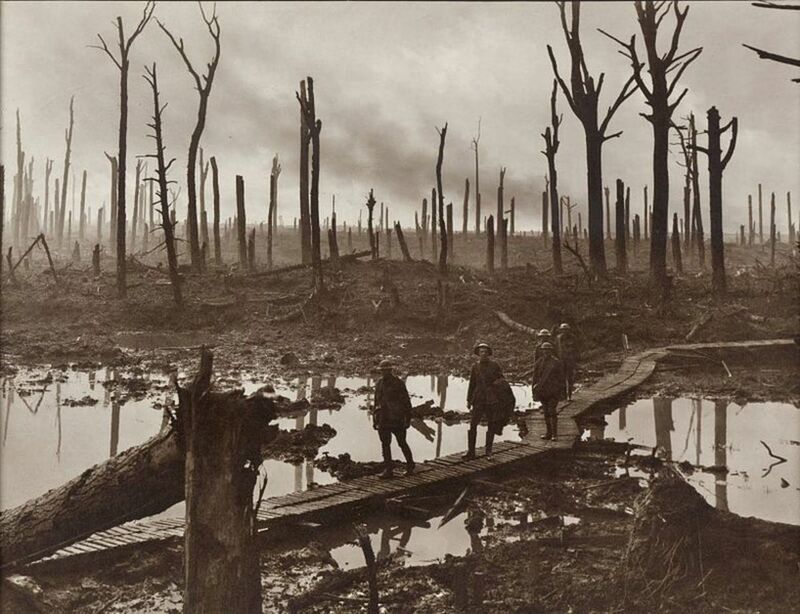 16th - Passchendaele reoccupied by German forces. 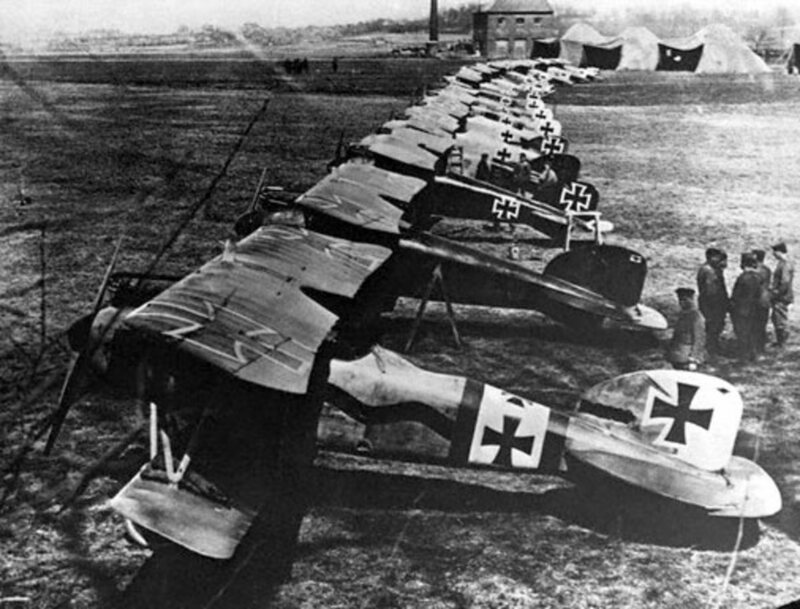 21st - The Red baron is shot down and killed in France. 23rd - Guatemala declares war on Germany. 29th - Operation Georgette ends. The Germans had gained ground but not reached their objectives, the channel ports. 30th - The first US troops arrive in France. 1st - Part of Russian black sea fleet is seized by Germany. 7th - Final peace treaty signed between Romania and the central powers. 8th - Nicaragua declares war on Germany and Austria-Hungary. 12th - Military treaty signed between Germany and Austria-Hungary. As the war progressed, Austria-Hungary became more reliant on Germany and more subordinate to Germany. 23rd - Costa Rica declares war on Germany. 27th - Third battle of the Aisne begins, also known as operation Blücher-Yorck. German forces attack the Aisne sector held by French troops. 6th - Third battle of the Aisne ends. Similar to the previous battles the Germans made a large initial gain but the attacks then ground to a halt. American troops would then counterattack at Belleau wood in their first major battle. 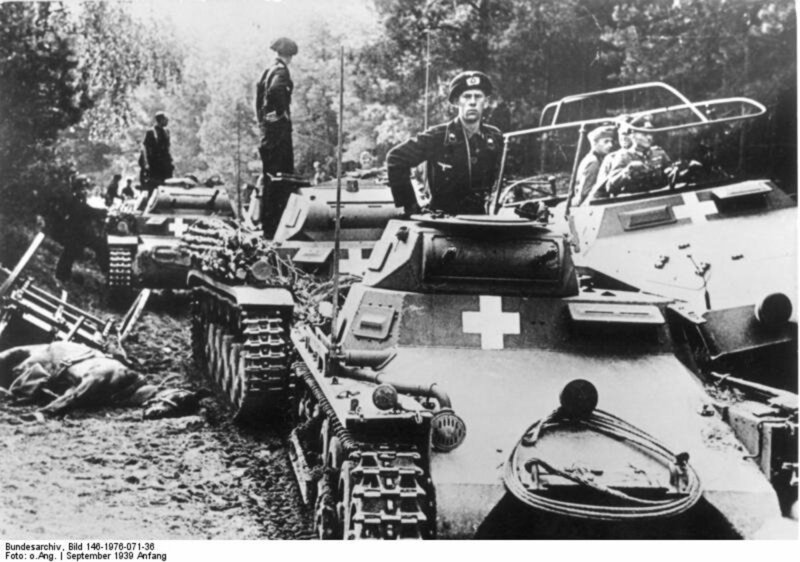 9th - Battle of the Matz starts, also known as operation Gneisenau. German troops attack to push allied troops westward and widen the German salient. 14th - Battle of the Matz ends. 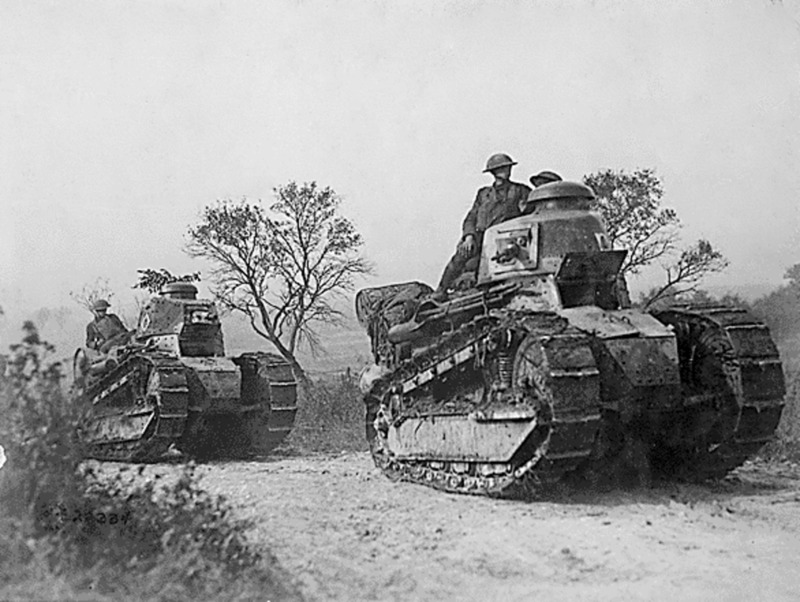 The Germans had initially progressed but were quickly halted by a French and American counterattack supported by tanks. 30th - First US troops arrive in Italy. 4th - The battle of Le Hamel, Australian troops supported by American troops, British tanks and air support attack German defenses around the town of Le Hamel on the Somme. The salient was captured in 90 minutes. This battle demonstrated the effectiveness of the improved combined arms tactics now employed by the allies. 12th - Haiti declares war on Germany. 15th - Second battle of the Marne begins, the last part of the spring offensives. This was actually intended as a diversionary attack to draw in allied reserves from elsewhere for a final offensive to break through. This diversion was an attack either side of Reims to cross the river Marne. 17th - Tsar Nicholas II and his family are executed by a Bolshevik firing squad. 18th - Allied counterattack begins against Germans on the west of Reims, who had managed to cross the Marne. 19th - Honduras declares war on Germany. 2nd - Allies recapture Soissons. 5th - Second battle of the Marne ends. The Germans have been pushed onto the backfoot and their proposed final offensive is called off. 8th - Amiens offensive begins. This is the first of a series of offensives now known collectively as the 100 days offensive, that would eventually see the allies push the Germans in retreat beyond the Hindenburg line. The allied armies used combined arms tactics to attack the weakened German defences, successfully producing a war of movement. 13th - Czecho-slovaks are recognised as allied belligerents against Germany but Czechoslovakia will only declare itself as an independent nation. 3rd - Amiens offensive ends, the German army had been pushed all the way back to the Hindenburg line. 12th - Battle of St. Mihiel begins, this is the first major American attack (supported by French tanks and artillery). 12th - Battles of the Hindenburg line begin. A series of allied offensives aimed at breaking through the Hindenburg line of defenses. This consists of a series of battles: the battle of Havrincourt, the battle of Epéhy, the battle of Canal du Nord, the battle of St. Quentin Canal, the battle of Beaurevoir Line, the second battle of Cambrai, the battle of Courtrai, the battle of the Selle, the battle of Valenciennes and the battle of Sambre. 16th - Battle of St. Mihiel ends. The Americans had caught the Germans while retreating and hence the attack was unexpectedly successful, taking 15,000 prisoners. 26th - Meuse-Argonne offensive begins, a major offensive by American and French troops to push German troops further east and cut them off from their rail network. 30th - Bulgaria signs an armistice with the allies. 3rd - Germany and Austria-Hungary send notes to the USA proposing an armistice. 8th - President Wilson replies to Germany note, demanding evacuation of occupied territories as first condition of an armistice. 9th - Cambrai city captured by British forces. 12th - German government replies to President Wilson and accept the conditions. 14th - President Wilson replies with additional military conditions and insists on dealing with a democratic government. 20th - Belgian coast completely reoccupied by allied forces. 20th - Germany again replies accepting all the conditions. 21st - Germany halts unrestricted submarine warfare. 23rd - British advance on Mosul begins. 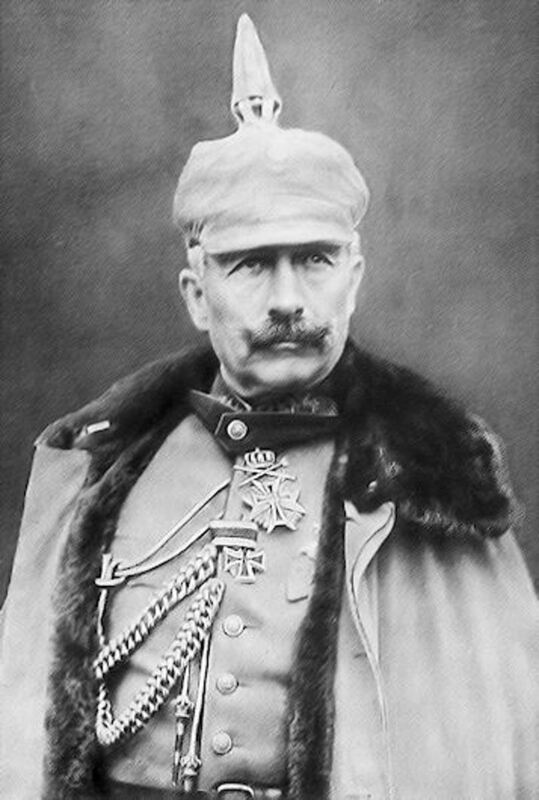 27th - German general Von Ludendorff resigns. 30th - Armistice signed between Turkey and the allies. 3rd - Austria-Hungary signs an armistice with the allies. Mutinies and strikes begin breaking out within Germany. 4th - Battles of the Hindenburg line are finished. The Hindenburg line was broken, German troops were surrendering in large numbers and in continuous retreat. 4th - British forces occupy Mosul. 8th - German armistice delegates reach allied general headquarters. 9th - The Kaiser abdicates and goes into exile in the Netherlands. The German monarchy is over and Germany is now a republic. 10th - Romania reenters the war on the allied side. 11th (5 am) - Germany signs an armistice with the allies. 11th (10:59 am) - US soldier Henry Gunther is killed, the last soldier killed in combat. 11th (11 am) - The guns finally fall silent on the western front. The immediate aftermath of the war was the enormous amount of casualties. Not only were there the dead but also soldiers who had survived the war and returned home with permanent scars such as amputations, facial disfigurements or shellshock (a kind of PTSD) caused by the intensity of fighting. The biggest cause of these casualties was artillery. The war had introduced the concept of a 'total war', all countries had mobilised their full manpower and industry towards the goal of winning the war. This lead to civilian targets being deemed as legitimate targets as evidenced by the naval blockade of Germany, German submarines sinking merchant shipping and the shelling or aerial bombing of cities. Note that these figures are not to be taken as completely accurate but as best estimates. Obtaining accurate figures was impossible due to the nature of the warfare and also the revolutions in government of multiple countries at the end of the war. Even after the war, deaths continued from aftershocks of the war. The allied naval blockade of Germany was maintained after the end of hostilities up until the peace treaty was signed, continuing the struggle of German civilians to survive. Throughout 1918-1919, a deadly airborne influenza virus (also known as Spanish flu) afflicted the globe. The spread was aided by the close quarters of the war and movement of troops. Particularly at the end of the war, when celebrating troops travelled home in large numbers. The virus is estimated to have killed between 50-100 million people, more than the war managed in four years of brutal fighting. The Russian civil war would continue until 1922, with the Red army eventually emerging victorious and forming the Soviet Union. 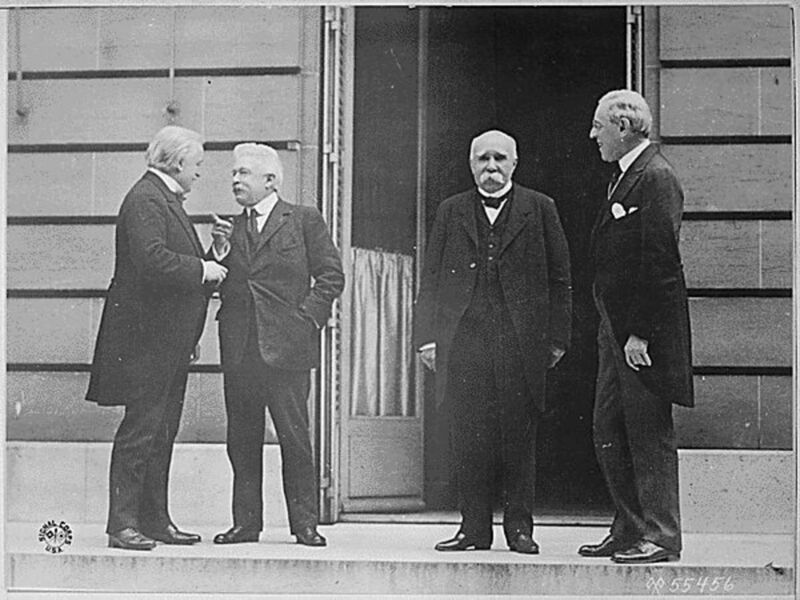 A peace treaty, the treaty of Versailles, was finally signed between the allies and Germany on 28th June 1919. The terms of the treaty are a point of huge debate, either being seen as too lenient and not removing Germany's future capability of starting wars or too harsh and encouraging resentment within Germany. Points of debate include the reparations to be paid by Germany to the allies and whether the treaty placed too much responsibility for the war on Germany. A significant part of the treaty involved forming an intergovernmental organisation to maintain world peace, known as the league of nations. However, the United States senate refused to ratify the treaty of Versailles and hence the significant presence of the USA was absent from the league. This is not peace. It is an armistice for 20 years. Another huge impact from the war was the decline of empires and creation of new nations based around existing ethnic groups declaring independence. The Austro-Hungarian empire had collapsed and was broken up into Austria, Hungary, the new nation of Czechoslovakia and Yugoslavia was formed by merging Serbia with some of former Austria-Hungary. The Soviet Union lost parts of the former Russian empire with the new nations of Finland, Latvia, Estonia and Lithuania forming. 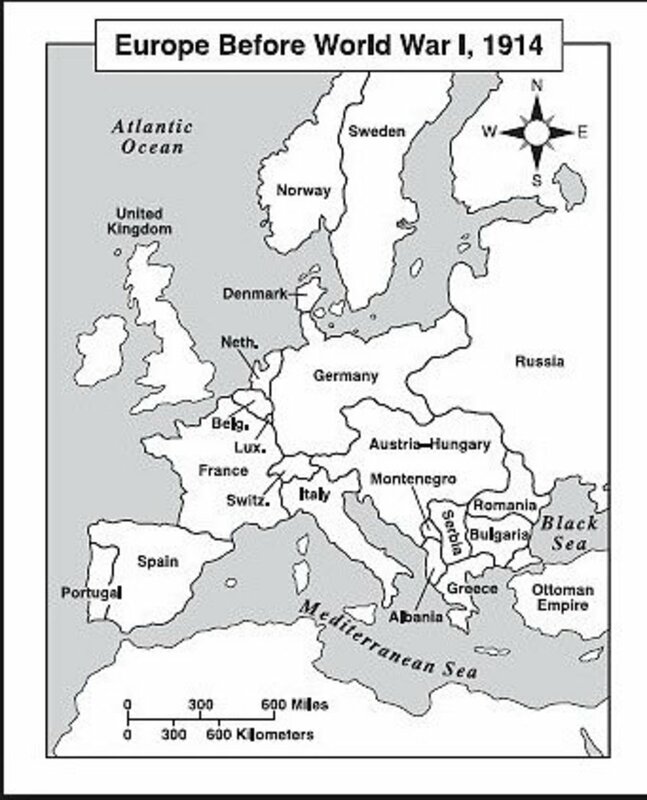 The colonies of the German empire were divided up between the allies and Poland was formed from both Russian and German land. The Ottoman empire was broken up, becoming Turkey and having its territory in the middle east partitioned by the British and French. This meant the creation of new arab countries: Syria, Lebanon, Iraq, Transjordan and Palestine. These arbitrary divisions are a major factor in the chaos and conflict in the Middle East that carries on to this day. Troops from around the British empire had fought in the war, as well as French colonial troops. This helped forge national identities, sowing the seeds of independence movements and accelerating the break up of even the victorious empires. The war devastated the major european economies hence the demand for German reparations. Britain had to take out large loans from the USA to finance the war. This was another sign of the declining power of the British empire and rise of the USA as the dominant world power. Belgian and French farmers still discover unexploded shells to this day. 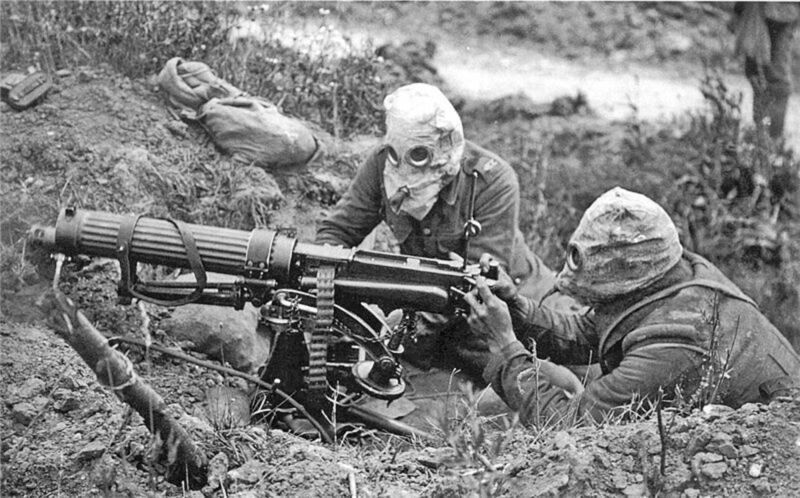 Therefore shells are still injuring and killing people on the western front, with poison gas shells a particular issue.